Signaturit is participating in DIA Amsterdam 2018! A new edition of DIA Amsterdam is coming! As mentioned on their website: “the yearly shot of inspiration for the newest insights for insurtech and innovation in insurance”. The 4th edition of this event is taking place the 16th and 17th of May, and already for the second time in Amsterdam. It promises to be a great event again, and Signaturit will be there, this year together with the Belgian law firm De Groote-De Man. We have been working together with DGDM to develop a new solution for insurance companies that will help them comply with GDPR. This solution is called eConsent, and we will be presenting it at DIA Amsterdam. 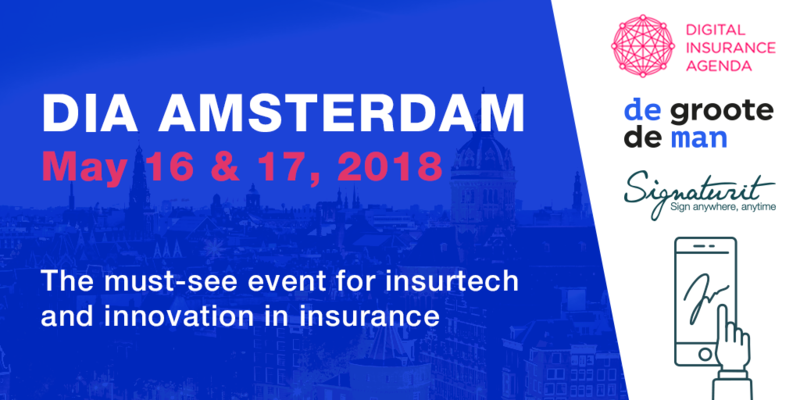 In this article we provide you with more information on our joint demo with De Groote De Man and on what you can expect of this 4th edition of the top insurtech event in Europe. DIA stands for Digital Insurance Agenda, and is now the largest insurtech event in Europe for presenting the latest innovations in the insurance industry. The insurance sector will look very different in a few years from now. The event has been established after recognizing the need to connect insurance executives with fintech leaders in an efficient and effective way. The goal of DIA is to fulfill that need in order to accelerate the crucial innovation of the insurance industry. The agenda of this 2-day event is full of interesting presentations, speeches, networking moments etc. and more than 50 insurtech companies have been carefully selected to present their latest innovations. All these companies have the ability to contribute to insurance companies by creating new revenue streams, helping to save costs, simplifying business activities, implementing effective customer acquisition techniques and much more. During the ‘Show and Tell’ sessions selected companies will present their latests solutions. In this short presentations the companies will explain the true added value that their solution provides to the industry. These presentations are comparable to the popular TED-talks. Furthermore there will be keynotes by thought leaders like Egbert van Achter from Philips, a Dutch multinational technology company and Scott Walcheck from Tröv, an insurance company that offers innovative on-demand insurances. These and more speakers will share their vision to help insurance companies improve and accelerate their digital strategy. Besides presentations, there are also many moments on the agenda where attendees will get the chance to network with startups and insurance companies from all over the world. Signaturit has participated in every edition of DIA Amsterdam since the very beginning, back in 2016. In previous editions of DIA we gave a demo about the use cases of our product together with DAS (Barcelona, 2016) and Tripolis (Amsterdam, 2017). This year we have been invited to pitch again, and we’ll take advantage of the occasion to present a new solution that we have developed, together with the Belgian law firm De Groote De Man: eConsent. The purpose of eConsent is to help insurance companies comply with GDPR, the new data privacy law that will be fully applicable throughout the EU on May 25th 2018. In case you are interested in knowing how our solution works, don’t miss our Show & Tell session, that will take place on the 17th of May at 14:51. In this session will explain the technical and legal aspects behind this solution together with partner De Groote-De Man. Also, during the whole event we will have our own booth, where we will be attending anyone interested in knowing more about our eConsent solution. If you are active in the insurance sector, DIA Amsterdam is a must-see event. There are still tickets available to participate. Signaturit and De Groote-De Man will be there, and we hope to see you on May 16 & 17 in Amsterdam!